Thank You – You’re Almost Done! You are here: Home / Thank You – You’re Almost Done! 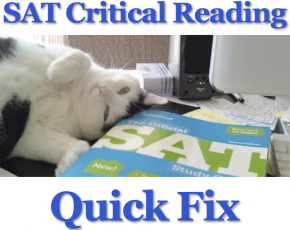 In order to download your copy of “The Top 10 Tips for SAT Success,” check your email and click on the link in that email. If you don’t see that email in your inbox shortly, it may be in your spam folder. Please add jeff@satsuccesssecrets.com to your address book or whitelist in your email program so that you’re sure to receive email from us. May you get the highest SAT score that you possibly can!